As the premier manufacturer and distributor of concrete formwork products, Wall-Ties & Forms has developed the formwork foundation system for contractors specializing in concrete foundation work. Regardless of the application, from simple structures to the most complex custom homes, our formwork foundation system will meet your needs. The key to your success in the competitive foundation construction industry is profitability. We know that lower costs and higher profits are determined by productivity. 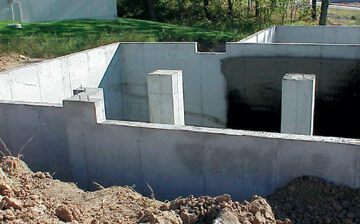 That's why we designed our foundation wall forming system to be fast and easy to use. WTF equipment is lightweight, and incredibly durable ensuring years of service. The WTF Foundation Formwork System comes with all the equipment you need to form and pour concrete walls in virtually any configuration, such as beam blocks and steel waler brackets. You won't find a more versatile system in the marketplace. Fillers 35" - 1" wide in 1" increments. Largest selection of smooth and brick-faced concrete forms available in the market today. Our panels have been field-tested for over 20 years and stand up to rugged daily use. They are stronger, lighter and have more surface area than wood-component panels. WTF SuperLite Panel is over 20 pounds lighter than our standard concrete forms and with proper care will last for five years or more of daily use. Uncomplicated pin, wedge and flat tie assembly makes on-site placement and stripping fast and easy. Our tough, sturdy concrete forms are easy to transport, handle and set. All these factors increase your bottom line. 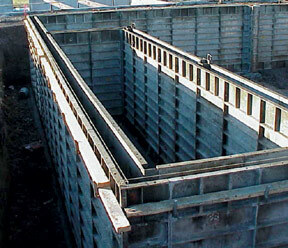 In addition to the Foundation Formwork System, WTF offers unique and innovative form designs for Crawl Space Formwork applications. For a demonstration of our formwork system and the use of our concrete forms please watch the video above. If you have questions about our formwork systems please contact us or feel free to browse around our web site for more information and examples of our formwork projects. 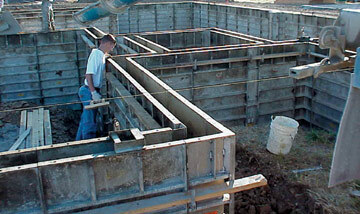 A good place for examples of our concrete forms is our formwork video page or our formwork portfolio page.